The libraries provide a variety of ebook collections to support academics and research at the University of Rochester. 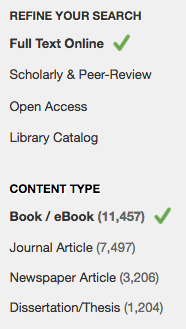 Different collections have different interfaces, and individual ebook titles may have added limitations on use. Listed below are the major collections available through the libraries, along with links to relevant help files. For more information about individual collections, see the browse by name list for databases. If you are having problems with an ebook, here are a few things to try. ♦ For help from the River Campus Libraries, ask at any Q&i desk, or use chat, Contact Us, or call. ♦ For Miner Library, use Ask A Librarian to find help. ⋄ Close and re-open your browser. ⋄ Turn off pop-up blockers. ⋄ Wait a few minutes and try again. Some ebooks only allow a single user, and someone else might be using it. ⋄ Try a different browser. ♦ Make sure you're authenticated. You are authenticated with any of the following. ⋄ You've used a library link to the ebook and entered your NetID & password. To find ebooks on a particular topic, search in Articles & Books using keywords for your topic. On the results page, select the options for Full Text Online and Book/eBook. It is easy to change your search terms while keeping the boxes checked. Or, look up the name of an ebook collection as a database, to access and search it directly. Adobe Reader DC is free software for reading PDF files, including those available in ebooks. We strongly encourage users of any electronic resource to be critical information consumers and to understand the privacy implications of their choices. We recommend that users read software agreements before installing programs on personal devices. If you choose to access services licensed by the libraries from campus or remotely using VPN, please note that "cookies" or other information may be required in order to verify that you belong to the University of Rochester community. The libraries make every effort to sign agreements with third party suppliers that will preserve the privacy of patrons, but the RCL cannot guarantee the privacy policies of those sites. Please be sure to check the privacy policies of each site you visit. The River Campus Libraries’ Ebook Central ebooks require a free Adobe Digital Editions (ADE) installation when an entire ebook is downloaded to a laptop or desktop computer. Libraries recently raised concerns about privacy in an earlier version of ADE. Those concerns have been addressed by Adobe in ADE 4.5. We suggest you install or update to ADE 4.5 when downloading ebooks from ebrary. The Monroe County Library System (MCLS) offers its members online access to ebooks and audiobooks. All county residents, including students at the University of Rochester, are eligible to apply for a free MCLS library card. Here is specific information on how to sign up for a library card. Once you are a member, you can access ebooks through the MCLS Overdrive system for digital materials.